Paul Rose - "Late Show"
Discovered by the late Rory Gallagher and twice voted Guitarist of the year by Guitarist magazine, Paul Rose definitely has the credentials to offer something promising. Supposedly an album for lovers and those feeling the stresses of life's fast pace, or an entrance into a tranquil spiritual zone. Late Show is a 15-track album lasting over 50 minutes, and it mainly works around pieces of music rather than songs. 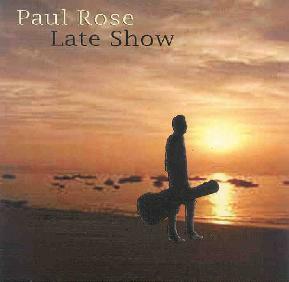 The guitar playing is good and it shows that Paul Rose is indeed a gifted guitarist. There are a few different angles to the tracks. There is a good mixture of mellow/ambient stuff complimented with material that is more upbeat. Keyboard pad sounds litter the album giving the guitar a chance to shine when required, which it does with great effect. That is what I liked about it. It is not specifically a guitar-based album. It has a lot in the way of keyboards and the whole thing to me sounds as if it should have been one long track instead of 15 individual tracks. These tracks are all relatively short in length, each ranging from 1 to 5 minutes and never stretch far over that limit. They all also fade to silence, which to me fails in the very thing that it is trying to achieve. An entrance into that spiritual zone. If the tracks did not fade in and out it would be more of a journey suited for entrance to that zone. The whole feel of the album is very new age like and the use of ambience is a major factor. The vibe is indeed mellow and the guitar style could be likened on the track 'Late Show pt 1' to Mark Knopler or Dave Gilmour. On the track 'The Journey', it is a very U2 delay style. Throughout as I have said there are a number of styles of music. My favourite track is 'Eastern View', the basic fact being it is the closest any track on the CD comes to my taste of music. This track is ambient and as the title suggests it has an eastern feel to it. It is a guitar driven piece that demonstrates again the Paul Rose quality. The atmosphere created reminds me of Dire Straits, the guitar is very 'Brothers in Arms', clean and crisp sounding with an extra touch of Clapton'esq slowhand. This is the style that Paul Rose seems to be pursuing and he carries it off very well. Most of the solos are in that vein so you can guess what is going to be played over whatever background. That seems to be his style, it is somewhat bluesish, as with Dave Gilmour and Eric Clapton. I am mentioning a certain slowhand style of guitarist here and Paul Rose to me is one of these players. So if you are into that brand of guitar playing mingled over mellow keyboard style pieces that flow with a new age feel... those that journey into realms of the hypnotic... enhanced by soft vocal guitar solos whose words are so very nearly heard... then Late Show would be a wise choice. Personally I found it interesting in its sound creation but to me it offered nothing new. I would term it as background music, or mood music. The stuff you hear in lifts/elevators, you know the stuff I mean right? Late Show is distributed by Hi-Note Music. You can visit their web site at: http://www.hinotemusic.com.